I had a clever idea that I would make a cookie tree this year for Christmas as I had seen pictures and thought they looked awesome. But I only had 4 star shaped cutters, way less than the usual 12! I toyed with the idea of making cardboard template stars for the sizes I was missing but that was sounding like a lot of faf so I thought “no problem I will just make smaller trees”. I began merrily measuring out ingredients for the new spicy gingerbread recipe I was testing forgetting that it would make a quantity of dough enough for a large cookie tree. By the time I started to get a funny feeling I was making a lot of dough the butter was already melted in with the golden syrup and spices and it was too late to stop. So I did what I had to do and continued making the dough. Next I merrily started cutting out the stars for the trees, counting the sets to make sure I had the right amount. 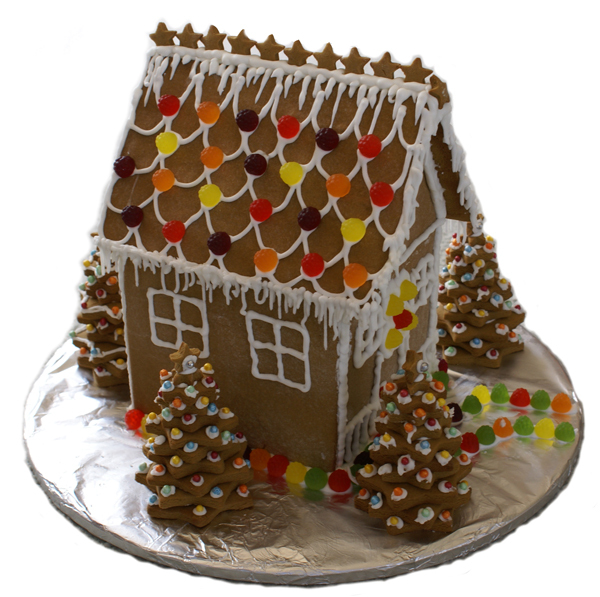 After enough stars for 5 trees I noticed the pile of dough hadn’t shrunk much and that’s when I had the brilliant idea (or so I thought) of making a gingerbread house. A quick google for some house dimensions, a bit of scaling to what I thought was the right size for the amount of dough I had left and I was off, measuring out the pieces. Soon I was muttering under my breath that I should have stuck to making trees as trying to get all the measurements precise while standing in a kitchen where the temperature was rapidly increasing was doing my head in. However I persisted and finally had 4 walls and 2 roof panels popped into the oven to bake. While the baking magic happened I made the royal icing for decorating with using the December Recipe Club Recipe. Now if I thought cutting the bits out was hard, sticking it all together and keeping it in place while it dried was the next challenge. But thanks to two glasses of the right size to hold the walls and roof panels in place at the same time I completed the structural “glue” job in one go and left it to dry overnight. The next day the real fun could begin – decorating! I found I had to get in touch with my inner child and go with a rustic decorating method as the royal icing was getting warm in the piping bag very fast, that day being one of the hottest days of the summer so far, and so the icing was not cooperating as it should have been when being applied. But I have to say when I finally stood back for a look I was quite chuffed with what I had achieved! 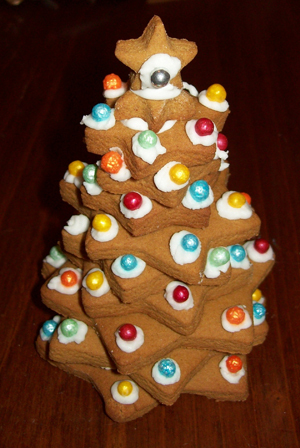 And that is how I ended up with a Gingerbread House this Christmas and 5 lovely star cookie trees to go around it. I hope you too are enjoying whatever gluten free treats you are making for your Christmas this year. It’s not too late to make your own star cookie tree as there is a recipe for cutter cookies here that would do the trick, just add some ginger and nice Christmas spices to the recipe. That’s the last post for 2015. So Merry Christmas everyone. Wishing you all a safe and happy festive season. Look forward to you joining us here in 2016!